Q.Due to leakage in basement parking, white spots are developed on the car. How to remove the same? I tried with Car shampoo but in vain. White spots are mineral deposits from the hard water in your basement. A car shampoo is not the likely solution. JOPASU Lime Scale remover is formulated to effectively remove lime scale (mineral deposits) or water spots from painted , chrome and glass surfaces. It removes the scale build up. Generally it is done after shampooing your car. For retaining the gloss of that area use one step compound Jopasu Fusion or apply Jopasu abrasive compound like J Cut/ J Cut+ etc. followed by Premium paste wax or One step polish wax. * Note: Always follow the procedure for using Lime Scale Remover. Q.I'd like to wash my car which is wax treated. Which product of yours is safe and will not strip this layer? JOPASU provides three shampoos in DIY (Do-it-yourself) range. Bio Car Shampoo , Wash N' Wax Shampoo and Wash N' Shine Shampoo. All the three shampoos are ph-balanced. All are safe and will not strip the layer of wax if they are used in the right proportion mentioned in the description of the product. 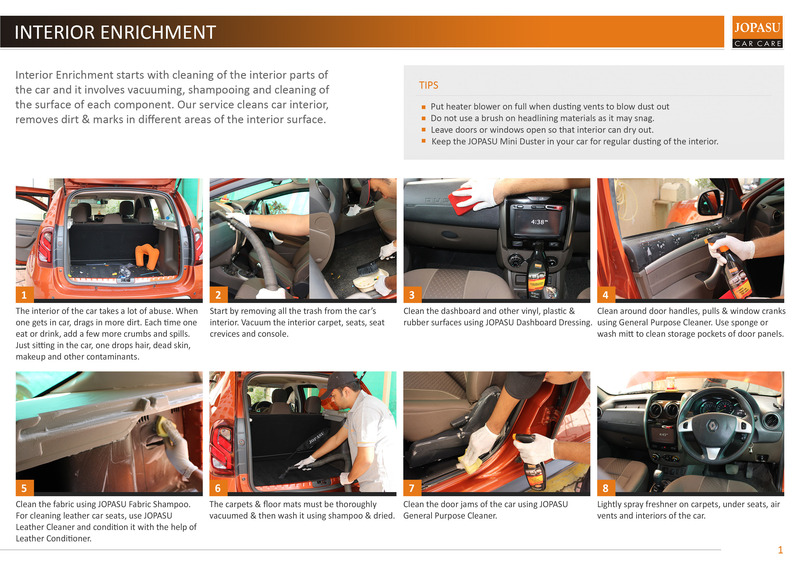 For you to retain the same shine which your car currently have, JOPASU Wash N' Wax would be the right choice. Q.Is Pressure Wash harmful for wax treated cars? Q.What is the best way to restore gloss to a dulled painted surface? Lack of gloss on the painted surface can be caused by several factors: 1) Oxidation 2) Scratches 3) Lack of a Protective Coating. Oxidation is the dulling of the painted surface that occurs when the sun’s ultraviolet rays deplete the paint’s natural oils and resins. Scratches prevent light from reflecting uniformly, which limits gloss. In order to restore gloss, the oxidation and scratches must be removed. Once the surface is free of oxidation and scratches and any swirl marks caused by compounding are removed, a wax or paint sealant should be applied. It will protect the paint against further oxidation, level the surface and intensify the reflection of light. Solvent-based and water-based dressings : These two category products are formulated to shine and protect vinyl, plastic and rubber surfaces. They each contain a shine agent (polydimethylsiloxane) that is delivered to the surface via a "carrier" i.e solvent or water which evaporates once applied. In Solvent-based dressing, if solvent is inhaled after evaporation it can be harmful to human body although masked with varied fragrances and hence are not used in the interiors of the vehicle. Water-based dressings are mild and used for Dashboard and Vinyl surfaces of car interiors. Solvent-based dressings are flammable, and should not be used on engines. They are best for the exterior parts of the vehicle. Solvent-based dressings are more durable since their solvents open the pores of the rubber, plastic or vinyl, which enables the shine agent to adhere to the surface. The shine agents in water-based products remain on the surface and, thus, rinse off more readily. Q.I use your Car Duster for wiping off the dust. I really love the product. But it gets too dirty within a span of 2-3 months. Thank you for kind words. 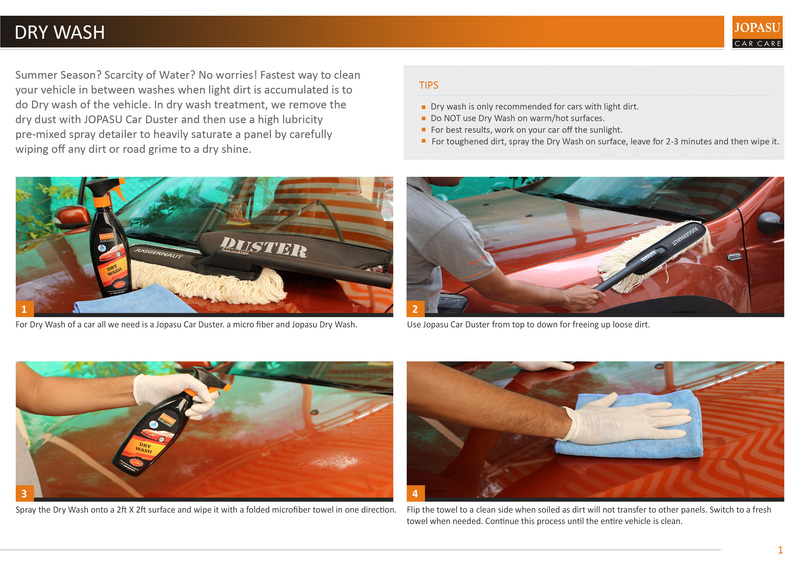 Car duster is used for wiping off the dry dust from your car. Before using the duster, one must shake well wipe the dust off your car, shake the duster well again and then keep the duster in the bag provided. Nonetheless, there will be dust attached to the strands as the strands are wax coated. A duster lasts for almost a year or more when its bought. Do not worry about the duster getting dirty. The dirtier it get, better it works. At some point of time when you see that duster has lost it capability of lifting the dust, you can wash the duster and use Duster Rejuvenator. Product details will entail the process of rejuvenating your duster. Q.The bird droppings were on my car and when I removed them there are marks or stains on the paint. what can I do? Bird droppings are highly acidic! They should be removed immediately. Fresh droppings or recent droppings will be removed by shampooing the car. But droppings from long is tough and gives a stain or a mark on paint. Analyze the stain and marks and take the desired steps 1) Light surfaces etches caused by acidic bird dropping can be removed by compounding or in some case a light polish. 2) If the acid has eaten through the paint or into the protective coating, in some cases they can be wet sanded out by sanding sheets and buffed out with a good polish or a compound. 3) Neglected bird dropping that have severely damaged the paint could in many cases require you to repaint that area. Q.What are the benefits of using a Wash Mitt or a Car Washing Sponge? It's the washing process that inflicts most 'swirls' or light circular scratches to your paint. This is because tiny particles can get trapped between the face of a cloth and the paint surface. Wash Mitt or Car Washing Sponge helps in generating more lather or foam which helps in trapping of the dust or dirt particles inside the lather thus helps in scratch free removing of the dirt. Q.What’s the best way to dry my car after washing? Dry the car immediately when washing. Many people prefer a chamois to remove the bulk of the water, others prefer a thirsty cotton (lint free) towel. However, a microfiber towel is perfect for the final wipe to remove the last of the water without streaking, especially on glass. They are also great for the intricate surfaces of chrome or aluminium wheels. When drying, work from the top down and be especially careful on glass since any streaks left behind are highly visible. Do the horizontal surfaces first because they do not drain as evenly and then the vertical areas. Finish with the wheels and tires. Don’t forget to wash the towels so they are clean and soft for the next time! It is the process in which the imperfections in the car’s paint are to be removed. This process removes swirls, etching, oxidation and other day-to-day external pollutants from the paint’s finish. Unlike many of the “swirl remover” products that exist, we use only the products that can actually fix the problem, not just fill them in temporarily. Because we do not fill surface defects, but actually level the flaws with micro-abrasive polishes and clean quality-pads, the surface will stay looking great for a very long time, as long as it is kept clean the right way. Q.Can I use these products in the sun? We highly recommend using our products, and indeed all car care products in the shade. Using them on hot paint in the sunlight usually causes the evaporative ingredients in the formula to evaporate too quickly, before its job is done. Q.What is a scratch, in reality? A scratch is a fine indentation that can be seen by the naked eye due to the refraction of light. Picture a scratch as a very thin valley in your car’s paint. Each side of the valley is sharp and refracts the sunlight in such a way that it is visible to the naked eye. Q.Why should I use a headlight restoration kit? Clear vision is an important safety measure while driving. Over time, your headlights can become cloudy or hazy in appearance and can reduce your night vision ability by up to 80%*. Restoring your headlights is a cost effective way to improve your vision without having to replace any parts. Q.Why do car finishes fade? How do you prevent it? 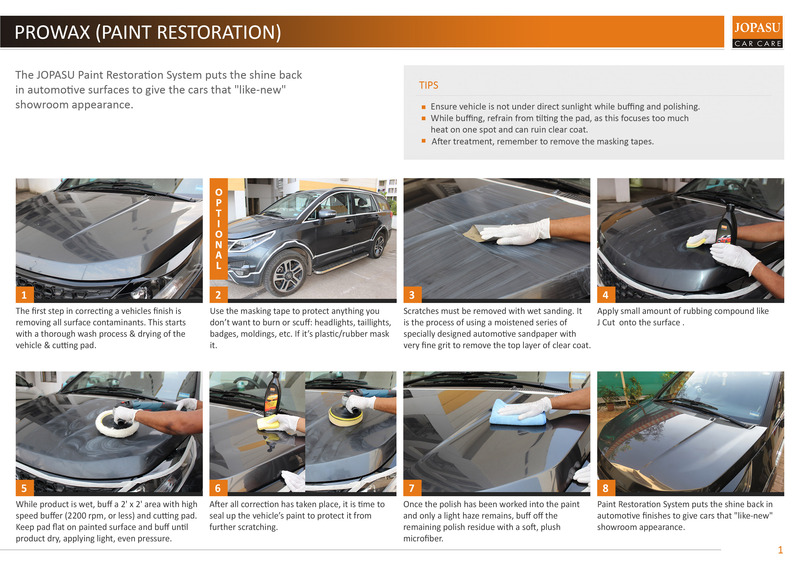 Q.Can scratches be removed from my paint job without my vehicle having to be repainted? Light surface scratches can be removed by compounding the surface of affected area. If scratches have only gone through one or two coats of clear, they can be wet sanded out. If scratches have gone completely thought clear coat, then the vehicle will have to be repainted. Q.Why use car shampoo when I can use dishwashing detergent or lower cost car shampoos? While the differences may appear to be almost non-existent, there is a large difference between a quality shampoo and regular dish washing detergent. The detergents they use have a pH that is different from that of shampoo specifically designed to work in harmony with automotive waxes and polishes. In the case of dish washing detergents, they cannot tell the difference between the oils that are food-based and wax. It looks at the two as one and the same and therefore will strip any wax or polish on your paintwork resulting in a loss of paintwork protection. Jopasu Shampoos are designed to work in conjunction with Jopasu range of waxes and polishes. It's highly gentle formula will not strip wax or polish but is formulated to remove dirt and debris on your vehicle body's paintwork. Q.How frequently should I wash my wheels and tires? It is best to wash your wheels and tires each time you wash your car, every week or every other week. This will prevent build-up in the wheels and keep the cleaning process minimal. 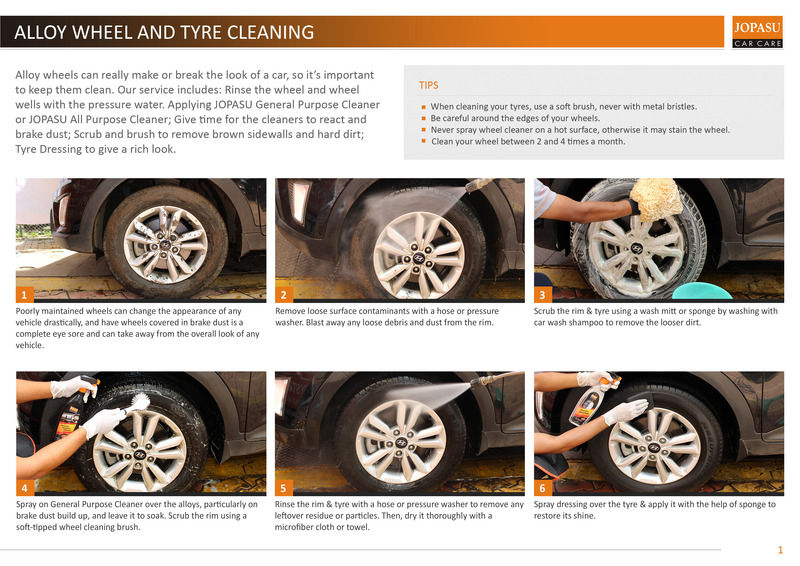 It is safe to use a car wash solution on your wheels first and follow up with the Wheel Cleaner. Q.How often should I wax my vehicle? Waxing frequency depends on the type of wax or protectant (paint sealant) you use, the climate you live in, the shampoo you to wash your vehicle, usage of pressure for washing etc. Always check the Product description and characteristics to check whether the product is only natural wax or having silicon polymers. Wax coatings usually can last upto 4-6 weeks and protective coatings from 12 to 15 weeks. A complete ultra pack treatment will last upto a year. It is essential to follow the basic points listed below: 1. It is critical to ensure that the paint is free of dirt, tar, grease, and other surface contaminants before applying wax or protectants. Neither wax nor protectant will adhere to a dirty surface. 2. Constant exposure to bright sunlight will accelerate wax and protectant deterioration. Harsh weather conditions like rains, hail storms loosens the chemical bonding of the sealant with the surface. 3. When washing a freshly-waxed surface, be sure to use appropriate car shampoo like Wash N Shine Shampoo, Bio Car Shampoo or Wash N Wax Shampoo. Q.How do I remove small scratches and swirl marks? For removing swirl marks use Jopasu One Step Polish wax, Jopasu Fusion or Juggernaut Cut and Glaze. Use the products by circular polisher or by hand in a circular motion. Q.Is liquid, paste or spray wax best? You have 'one step polish wax', 'premium paste wax', 'silicon polish' and 'spray wax'. So confused which to buy. Q.What is the best wax to protect my new car? For the new car the best treatment would be to give the Ultracoat treatment. It will give the best protection for your car. Carnauba wax is created from the Copernicia Prunifera palm tree leaves, which grows in Brazil. The dried palm fronds are beaten and then refined into wax. Carnauba wax polish has become one of the most used and popular forms of car wax. Carnauba car wax has a long lasting effect and benefit to the exterior paint on your vehicle. Owing to its hard wearing properties, it is favored among many other waxes available. Q.What is the difference between PAINT SEALANT and WAX? PAINT SEALANT forms a clear chemical bond that protects the finish of the vehicle and maintains that new car appearance. It is guaranteed to keep its shine for at least one whole year with proper maintenance. WAXES leave microscopic layers of fine wax particles providing deep shine and protection. With regular maintenance and care, the deep shine can last for 3 to 4 washes (using of household detergents and caustic based shampoos will strip-off the wax). Q.What is the difference between polishing and waxing? POLISHING is designed to bring out the gloss. WAXING is for protection. Polishing is what makes the wet-look, deep gloss possible, especially effective on dark-colored cars. How long a wax lasts depends on a variety of factors such as the environment and how the surface is prepared. When applied before waxing or sealing, glaze helps hide minor scratches, spider webbing, swirl marks and other surface imperfections. It enhances clarity and shine, while giving darker coloured paints that deep, wet look. If left unprotected, a glaze will not last long. It therefore needs an immediate coating of protective wax or sealer to truly have long lasting benefit. Q.My vinyl dashboard is sticky and oily. What product can be used to have a smooth finish but not sticky and slippery. Vinyl dashboard can be first cleaned with General Purpose Cleaner (GPC) , either RTU (ready to use) or concentrated in right proportion. 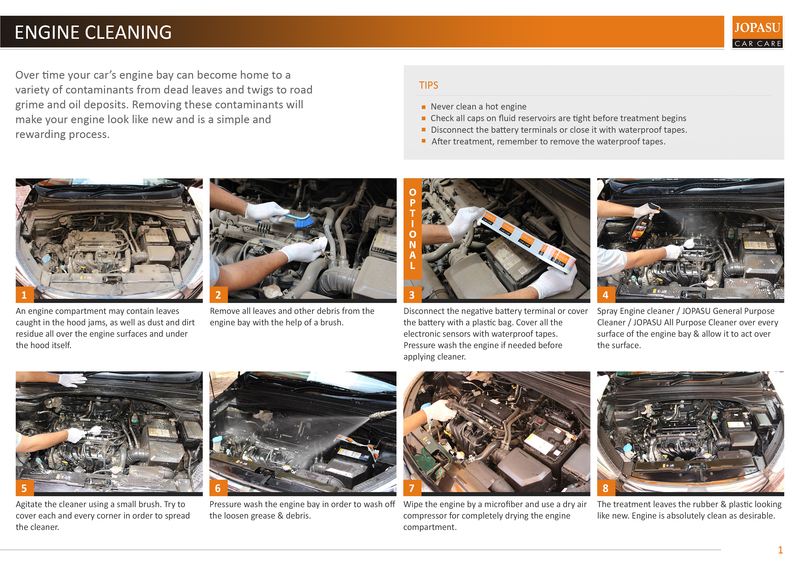 After cleaning, use a dash board dressings, Dashboard Protectant or Vinyl Protectant. After applying Dressing, make sure you remove the extras with the help of microfiber. To clean artificial leather use the mildest concentration of general purpose cleaner or all purpose cleaner or Leather cleaner. To dress and protect artificial leather use vinyl dressing. Q.Can I use Leather Cleaner on my sofa or house furniture? Yes, you can use Leather Cleaner on sofa or house furniture. Before applying test the product on a small surface to check its compatibility. Q.How can I protect my dashboard from fading and cracking? Q.Will the leather cleaner work on vinyl seats? Yes, the leather cleaner will work on various surfaces including plastic, vinyl, rubber, leather and trim. Q.How often should I clean and condition my leather interior? To help protect leather from premature wear and tear, we recommend cleaning 1 to 2 times per year and conditioning 4 to 5 times per year, due to damaging UV sunlight, outdoor elements and the general abuse it suffers from your getting in and out of the car every day. Q.People talk about body shop-safe products. What is it? Are jopasu products body shop-safe? Automotive body shops repair, restore, refinish, and replace vehicle bodies and frames. They offer paintwork repairs to scratches, scuffs and dents to vehicle damage as well as damage caused by collisions and major accidents. In a body-shop environment, products containing silicone, waxes, ammonia, etc., which in contact with the surface to be painted causes "fish eye" effect resulting into the repainting, should not be used. Detailed description of JOPASU products will indicate whether the product is body-shop safe or not. Mainly there are two types of pads. Wool pad and foam pad. 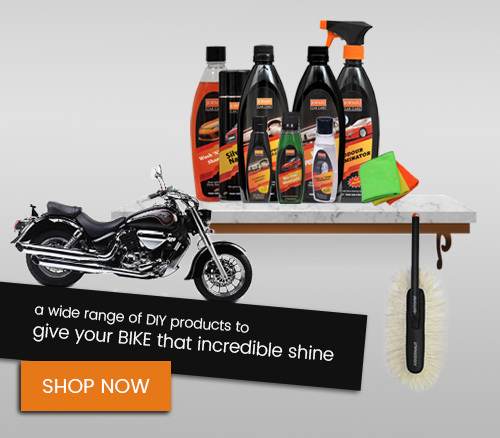 Those two categories have varied colors and sizes that are to be used on two wheelers or four wheelers. Various colored pads are used depending on the compounds to be used. There is a Pad Selection Guide in the Leanring centre which you can go through for your reference. Q.How often should I detail my car? We recommend that a vehicle needs to be professionally detailed only1-2 times per year. Q.What are your office timings? Can we visit to see the facility? Our office timings are from 9 to 6 pm. Please take prior appointment to visit the firm. Contact numbers are provided on this website. Q.What surfaces can I use Joapsu on? Jopasu is safe for all hard, smooth, surfaces on cars, trucks, SUV’s, motorcycles, limousines, ATV’s, snowmobiles, boats, aircraft and any other vehicle. It can be used on paint, chrome, plastic, glass and mirrors. Q.Why does Jopasu make so many products? Jopasu offers a variety of products to meet the wide range needs of demanding users. Whether you are a do it yourself enthusiast or a highly trained professional, Jopasu has a selection of products, pads and accessories that will solve your every need. Q. I want to make sure these products are safe on the various surfaces of my car – how can I find out for sure? 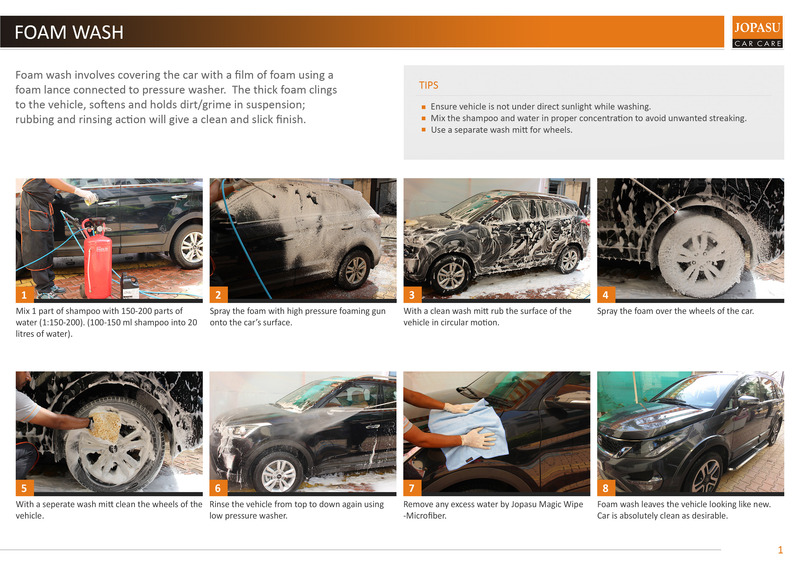 While our products are safe for most of your car's surfaces, it's smart to be sure before you begin using a product. Visit the individual product pages or check label for usage instructions. "Orange peel" is a term representing the texture of a painted surface that has "hills and valleys" or bumps similar to the skin of an orange. 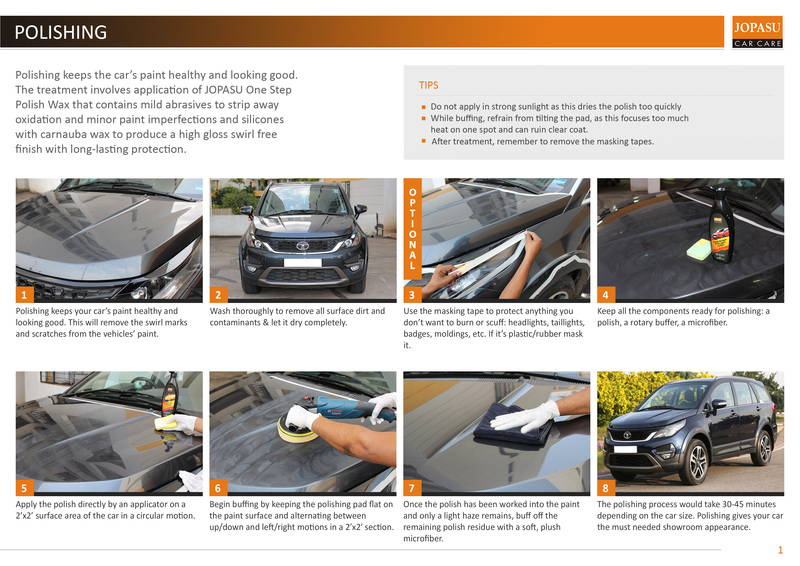 Excessive orange peel is considered a paint condition defect and can be effectively repaired using Jopasu's recommended Surface refinement & protection procedures. Under-coatings are chemical compounds usually applied to the undercarriage of a motor vehicle, hence the name. Under-coatings may also be applied to other areas such as the trunk, wheel wells, etc. Q.My car has several layers of paint when it was applied in the factory; that should offer ample protection, shouldn't it? Your car would have good protection against corrosion. However, paint could not resist abrasion, and because of poor road conditions, unprotected paint would suffer from stone chips, scraping against humps or rocks, pitting from gravel, etc. Eventually, a lot of paint would peel or scrape off to expose bare metal to corrosion. Also daily washing of car by untrained labours, environmental and atmospheric abuses would deteriorate the paint structure. 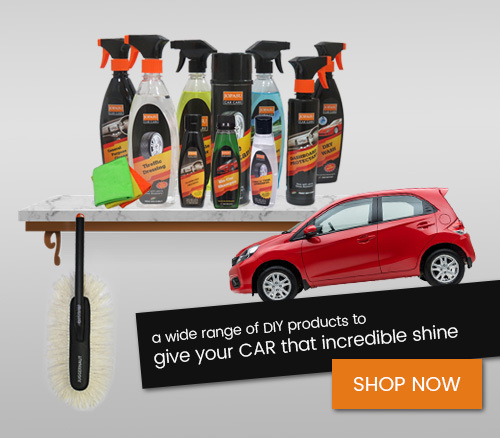 Q.Are Joapsu car care products compatible with other detailing products? We would suggest you use Jopasu products solely for best results since they are designed to work together as a complete system. This is especially true in regards to the polishes and wax. However, you can use Jopasu with other product brands without any concern. Further, we suggest comparing other product brands side-by-side with Joapsu products. We are confidant you will see the difference and make Jopasu your first choice.